Fiji Bitter, a beer I review at the end of May, earned Beer Connoisseur (Level 13). This is a badge that is for drinking beers from different countries, and subequently indicating I've sampled beers from 65 countries since joining Untappd. The beer isn't bad, but also isn't worth seeking out. The honour of Finding the Source (Level 4) went to Thirsty Crow's Sporting Ale, at their brilliant venue in Wagga Wagga! I thought this was a wonderful Kolsch and one I would certainly seek out again. With any luck I'll get the Out of Office review for this venue done on the plane. Another brewery I managed to visit on the drive up to Byron Bay for work was the New England Brewery in Uralla. Their New Englander Farmhouse Ale was the first, of three, of their beers to earn badges. It was a very clean Saison, which is open fermented in the traditional way. I was very impressed by it actually. Trip to the Farm (Level 9) was the badge. Keep Your Wits About You (Level 2) was the second badge to be earned by a beer from New England Brewery. The beer was their dark wit (something I can't recall having had before); New Englander Black Sheep. It's a beer that really impressed me; particularly with the peppery spiciness towards the back end of tasting. I would be interested to try more dark witbiers in the future. The third, and final, beer from the New England Brewery in Uralla to earn me an Untappd badge was their New Englander Frederick India Red Ale Hop Cannon. It started off as a nice Red Ale, with plenty of carampel malts present. For a beer with the phrase "Hop Cannon" in the name I thought it could have packed a bit more bitterness, but the flavours were nice. Hopped Up (Level 12) is why I'm mentioning this beer now. 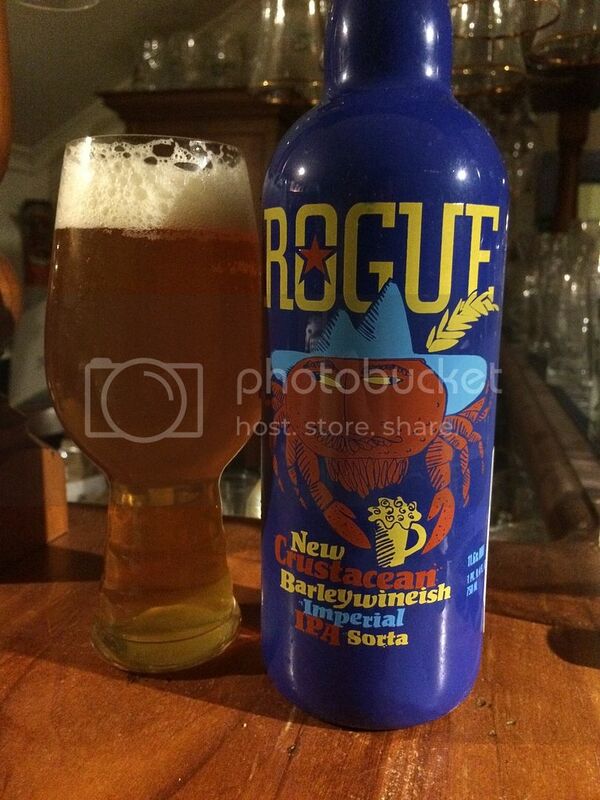 Rogue New Crustacean Barleywineish IPA has to go down as one of the most confusing beer names out there, as well as one of the longest. I actually quite enjoyed the sweetness of the Barleywine component that offset the hops very nicely. It's not a beer I'd drink everyday, but with it's bright blue bottle it'd make a nice present for someone. Pucker Up (Level 18) went to a beer that I was planning to review but ran out of time; Nomad's Freshie Salt and Pepper. It's a Gose, a style that is not brewed anywhere near enough in Australia but is gaining in popularity. This is on the lighter sour scale but has great saltiness. I remember not getting too much pepper, but did get some. It's a beer I hope to re-visit when I get home. Dutch Beer Week has been and gone and I ended up with the badge after sampling 3 offerings from my favourite Dutch brewery; Emelisse. Their Espresso Stout was the beer that got me over the line. It was excellent with plenty of coffee and roast flavours. It was wonderfully creamy and one I will certainly be looking out for in the future. Inveralmond's Blackfriar unlocked God Save the Queen (Level 27). I remember having it after a big night and that there was some dark fruit flavours and strangely banana, but little else. What I do know is that Inveralmond is a Scottish brewery from Perth (Scotland not Australia) and that this was supposed to be a Scotch Ale, which it may well have been... I will revisit it down the track. The Jester King shipment that arrived for Good Beer Week has been creating some serious waves in Australian craft beer circles. Repose is the first of mine that I cracked into and as an aside it earned Land of the Free (Level 36). It's a Biere de Garde and is truly unique and exceptional! It's had hay added to the mash, had old hops added and is then left to age in brandy barrels for months. It's very complex and makes me so grateful I bought 2 of these! Evvery single time I do one of these reviews a Tru Bru Bear Club beer makes the cut. Tuatara's Sauvinova, a Single Hop Pale Ale brewed with Nelson Sauvin, was that beer this time as it earned Drink Like a Kiwi (Level 20). This was a spectacular beer! It's packed full of tropical fruits, particularly gooseberries (which Nelson Sauvin is known for) and pineapple. There's nice amounts of grapefruit as well that add good bitterness. Grand Ridge 25th Annivesary was the beer that unlocked the commemorative badge for the Womens World Cup. It was a standard Australia Pale Ale, a beer which I didn't think did justice to Grand Ridge's 25 years of service to the brewing industry. Hopefully they'll still be around in another 25 years and be able to brew something more memorable for their 50th! HopDog Beerworks make some of the most interesting beers in Australia from their Nowra (mid NSW coast) base. Their Black IPA; Children of Darkness, is no exception. The one I sampled on this occassion was found cleaning out my beer cabinet and may have been a tad past it's best - but trust me from past experiences this is a Black IPA not to be missed. Hopped Up (Level 13) is why we're talking about it, you've already seen this artwork in this review for the Hopped Up badge so there's no need for me to re-hash that. A simple Carlton Draught stubbie on the way to the State of Origin game at the MCG unlocked a new badge for me; By the Campfire. It's a location based badge, which research showed me is unlocked by checking into 5 beers with locations considered by Untappd to be outdoors. All of you should know what Carlton is by now so I won't even go into it. The beer I decided to pack with was an absolute blinder! Big Shed's GABS offering was Golden Stout Time - a Golden Gay Time flavoured stout! This tasted EXACTLY like a Golden Gay Time! I wish I had more/they brew it again! It earned two badges Heavy Weight (Level 32), a badge you've already seen before, and New Brew Thursday (Level 13), my arch nemesis - see previous Untappd Catchup's for backstory. In short though, if you only have one beer from this review make it this one! As a badge whore there was no way I was not going to check into 2 Founders Centennial IPA's to earn the Bi Centennial badge. On my last day in Australia I rushed around looking for the second can I needed, it was found and enjoyed. It's an IPA I've enjoyed many times before and one I'd highly recommend. So there we have it guys, an absolute monster of a Catchup for you. I'm in Europe now and will see how I go updating you on my beer exploits. So far it's been good, Austria surprised me quite a lot. Currently I'm on the boat on the way to Bratislava, Slovakia - a city and a country which I am not holding high hops for (beer-wise of course!). Until next time guys, keep letting me know what you're drinking and any thoughts of what you'd like to see on the blog in the future.